PARIS (AP) — With its Champions League campaign in danger, Paris Saint-Germain finally showed the grit and fighting spirit that is supposedly the hallmark of a proud English side like Liverpool. PSG beat Liverpool 2-1 in a tense match on Wednesday to move above the five-time European champion and into second place behind Napoli in a hard-fought Group C.
Coach Thomas Tuchel’s side had drawn twice with Napoli and lost away to Liverpool, a draw would have put PSG in serious danger of not qualifying. But now it’s Juergen Klopp’s Liverpool side that is under big pressure heading into the last round of games. Napoli, which beat Red Star Belgrade 3-1 at home, is one point ahead of PSG and three clear of Liverpool, leaving the three teams fighting for two spots in the knockout stage. Liverpool lost last year’s final, while PSG has never reached one and in the past two seasons has not even been in the quarterfinals. Tuchel is banking on an improved team spirit to turn that around. Klopp’s side must beat Napoli at home on Dec. 11, while PSG travels to last-place Red Star. 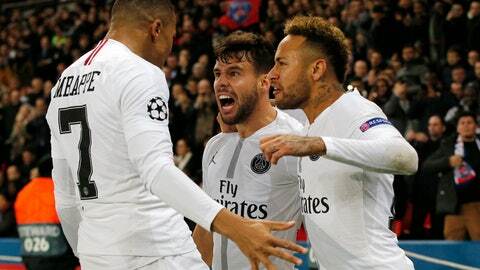 Left-back Juan Bernat and Neymar gave PSG a deserved 2-0 lead against a static Liverpool side, whose only attacks in the first half were predictable and slow forays down the right. Liverpool was given a lifeline on the stroke of halftime when forward Sadio Mane was clumsily tripped by Angel Di Maria and veteran midfielder James Milner coolly sent Gianluigi Buffon the wrong way from the penalty spot. Liverpool had the better of the second half but failed to create clear scoring chances, with Mohamed Salah particularly ineffective. Klopp was quick to criticize referee Szymon Marciniak and took a swipe at Neymar and other PSG players for what he considered to be play-acting. Klopp wanted PSG’s players to be punished more often. Tuchel wasn’t drawn into the argument. PSG celebrated the win almost as if it had won a title, with Neymar jumping over the advertising hoardings and leading the rest of the team into jubilant dancing in front of the fans. It was a clear sign of PSG’s relief. Tuchel got his choices right and his players responded to his request for more intensity. PSG’s 13th-minute opener had a touch of luck as Kylian Mbappe’s mis-hit pass was poorly cleared by Virgil van Dijk and Bernat lashed the ball into the bottom corner. PSG’s second goal came after another Liverpool move on the right broke down. PSG charged down the left and Dejan Lovren’s lack of pace was exposed by the electrifying speed of Mbappe. Alisson did well to stop Mbappe’s cross from the left reaching Edinson Cavani, but Neymar picked his spot from the rebound. Liverpool’s goal arrived with a timely shift down the left flank, as Mane got behind the defense and forced Di Maria into a panicky error. Liverpool upped the tempo in the second half. The mobile Mane was getting considerably more involved and PSG started to give the ball away carelessly. But as the pressure rose at a tense Parc des Princes, Liverpool failed to capitalize.